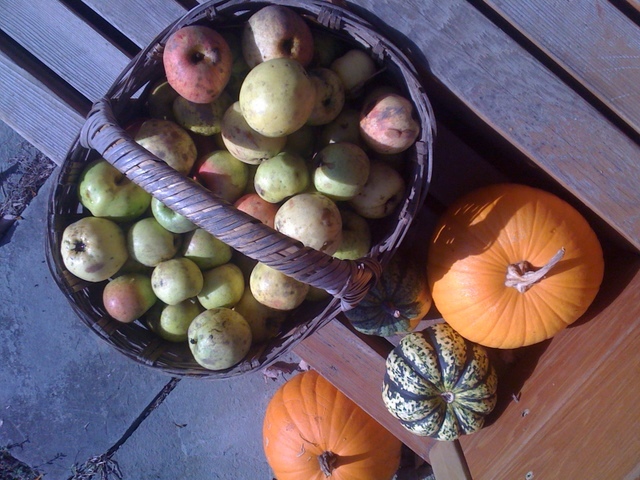 Roadside apples in early October. 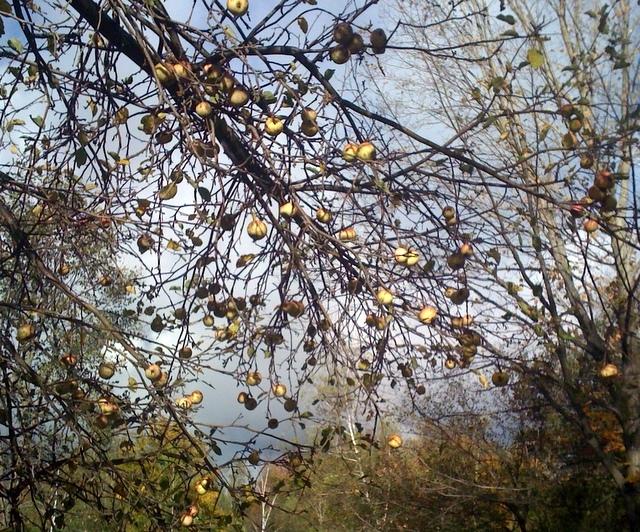 Despite the blossom-killing frost last spring,the wild apple crop seems to be as prolific as ever,proving that the feral fruits growing on this hard-scrabble hill are indeed well adapted to harsh conditions. 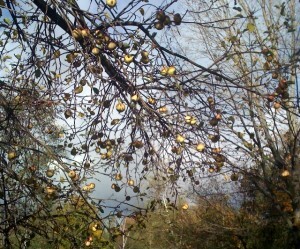 Unlike cultivated varieties that are propagated through grafting (cloning the mother tree) wild apples,like us,are the unique product of two distinct parents. So wild trees,even those growing side-by-side,produce fruits that look and taste completely different. The apple trees growing along our country road,with their unkempt jumble of limbs and gauges from ditching and plowing aren’t pretty. Their small fruits are pock-marked,insect damaged and bruised,but I love to taste and compare them. When walking up the road with our neighbors through the brilliant fall foliage,we pick apples as we go along,discussing and critiquing them,then later try to remember which trees produce the best fruit. It’s become a fall tradition. Flavors and textures are as varied as fine wines and can be described in the same way —bright,astringent,coarse,flowery,lingering. Even if the texture isn’t appealing for fresh eating it can be perfectly good for cooking. Timing too can make a difference. One of the most prolific trees on our walks had disappointingly inedible fruit earlier this fall but now after ripening fully,can be eaten and used in cooking. So we’ve learned to sample often and avoid deeming a tree’s fruit to be useless until the end of the apple picking season. When combined in cider,sauce or pies,a mix of wild apples results in a product full of character. I am especially fond of apple butter made from wild apples. Apple butter can be as simple as making apple sauce,using any method or recipe,then baking it in wide,shallow pan or cookie sheet in a low oven (about 300 F) for a couple hours until the flavors concentrate and begin to caramelize,stirring occasionally. Most recipes call for cinnamon and other spices,but when using wild apples,I can’t bear to mask the complex apple-ness so tend to cook them up with just a little maple syrup which adds a sweetness that is complementary. At Kerry and Nate’s annual cider-making party last weekend we pressed wild apples together with the Macs and other orchard grown apples and the resulting cider is a flavor-packed,lip-smacking treat. The perfectly decent,locally produced commercial cider we’d gotten someplace else tastes downright dull in comparison. I’ve got to quick,post this message now so I can justify pouring myself another glass of the wild cider!